U.S. Cellular Customers - Score Movie Tickets to Disney's "Big Hero 6"
If you are a U.S. Cellular customer and are considering adding a line, act fast and you can score free movie tickets to Disney's "Big Hero 6". This offer expires tonight! U.S. Cellular customers can score two free tickets to Disney's "Big Hero 6" in theaters, just by adding a new line. Qualifying consumers will receive a reward code valid for one movie ticket good towards two admissions (up to $26 value total) to see Big Hero 6 at participating theaters. Visit a U.S. Cellular store or uscellular.com for details. The winner of the Magnified Makeup Mirror giveaway is #70, Laurie Murley. The winner of the Indie Children's Books giveaway is #7, Janet W.
The winner of the rove giveaway is #2, heymissvirginia. The winner of the ZzzQuil giveaway is #39, bettycd. The winner of The World Almanac book giveaway is #42, Laurie Murley. Well, the holidays have come and gone. And, to be truthful, I'm quite all right with that. This time of year has been extremely stressful for me and I'm glad for the somewhat lighter load. My mind has been preoccupied with my mom being in the hospital. Even in the midst of all that's been going on, I enjoyed Christmas with my family and loved ones. Because we are a blended family, the kids are generally elsewhere on actual Christmas day. So Santa visited a couple days early and we celebrated at home. We opened gifts, played Rummy, watched a movie, and ate popcorn. The next morning we had homemade cinnamon rolls for breakfast. It's become tradition that every year Allyson makes them and we all eat them. Christmas Eve was spent at my sister's house with extended family. We gorged on food and opened gifts. If you know anything about 'A Christmas Story' you understand where the pink bunny suit comes in. My 10 yoa nephew played the part of Ralphie in the bunny suit. Christmas Eve evening was spent going to church service, singing and praising God. Her second day at the hospital with my son, Logan. I wish she looked even this good now. I'm not so sure my mom's fight with cancer will be a winning victory. I'm not so sure of anything right now. It's the world of the unknown that hurts the worst. Am I making the right decisions for her? Is she going to pull through this one? My mom has been battling lung cancer since September. It's been a long, hard road. As her main caregiver and Power of Attorney, I've seen too much of this disease. I've seen it rip the human mind, body and spirit from her. And I hate it more and more each day. Right now my mom is in the hospital fighting (or not fighting) for her life. The chemo and radiation are over and have been for a week, but I believe her will to live gave up before that. We don't know right now if she's in remission or if the cancer is still invading her body. We'll know soon. Mom has been in the hospital since December 23rd because she literally quite eating. And by literally, I mean it in every sense of the word. In the last month I can honestly say she's eaten less than one whole meal the entire time. How she's still here, I don't know. Since being in the hospital, it's been a big roller coaster ride. Her potassium is critically low. She still won't eat. A feeding tube can't be put in place until her blood platelets are at a certain level and she's medically stable. She's had hallucinations that have kept both her and me up all night. She barely wakes up long enough to take her meds. She's literally starving to death. And all while I sit and watch. Helpless. 1. My mom is a fighter. She's been through hell and back. She knows how to come back from a battle with a win. Even if she chooses that she's wore down and ready to throw in the towel, I respect her wishes. Even the strongest have to know when it's time to quit. It's not to say I'm ready for her to pass on; that couldn't be further from the truth. It's saying that I believe in my heart of hearts that she is worn down and wore out, and this is her way of letting us know that. I don't love her any less. I'm here with her to the end. 2. Family matters. It really, really matters. and I couldn't be a prouder momma with the way they've showed exemplary behavior. My siblings and others in the family have banded together with me to get me through this. My sister told me today that I've shown amazing strength during this time and she's super proud of all I've done for mom. Just hearing those words meant a lot. 3. People don't always know what to do to help, but they do want to help. We've all heard the saying "Just call me if you need anything". Pride gets in the way of actually calling or asking for help. I've had a lot on my shoulders and have taken much of the burden, mostly because I'm too prideful to ask for help. My husband took it a step further and actually called people out on their "just let me know if you need help". And people actually responded! A good friend and co-worker took me out for supper. She let me eat AND vent. Our church family, especially our small group, has been coming in almost daily to pray over mom. A dear friend spent the night at the hospital with me and mom last night. Just to be there, and be a friend. No strings attached from these people, just pure love and support. 4. Only God knows the plan. It's a world of unknown right now. I want to fix mom. I want everything to be okay. And it's not. But I know without a doubt that it's in God's hands and His control. I can only be there to love and support my mom. God will take care of the rest. If there's one thing I almost always try to achieve when styling my hair, it's volume. I want oomph; I want lift; I want life! But I have very thick, lifeless hair. And honestly, I don't want to spend hours on it trying to create an uplift. Not that it does all the work for me, but I have to say Samy Fat Hair hair care products have been quite beneficial in giving my hair volume and affording me the probability that my hair won't fall flat. Fat Hair’s new Advanced Repair Formula products now combine hair repair and damage protection, with your everyday hair care routine. These exclusive, amplifying formulas contain a blend of protein, botanical extract, Inositol, Taurine, Avocado and Olive oil to volumize and repair limp damaged hair for fuller, shinier, healthier looking hair. Most of their products can be easily recognized by the red bottles with white lettering. Five Fat Hair products were given to me for review and it's the only brand I've used for the past couple of weeks. Fat Hair Advanced Repair Amplifying Shampoo and Fat Hair Advanced Repair Formula Amplifying Conditioner are both sulfate free and 100% vegan. Using both regularly is step toward fuller, stronger, healthier hair because they repair, condition, and moisturize your hair, all while adding texture, body, volume and shine. I wash my hair every other day and I like how both of these products leave my hair feeling soft and manageable. 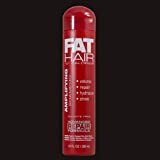 Fat Hair Advanced Repair Formula Amplifying Hair Spray adds volume, fullness and shine as it restores dry, damaged hair. The unique formula keeps style in place all day with touchable hold for easy re-styling, while the blend of protein, botanical extract, Taurine and Inositol helps repair hair as it boosts volume for soft, fuller, healthier looking style. It doesn't take a lot of hair spray to add the voluminous style I'm looking for. There's no reason to spray a lot on, as it may not allow for easy styling afterwards. There's no build-up and it doesn't weigh my hair down. My favorite of all is the Fat Hair Amplifying Mist. The lightweight mist transforms fine, limp hair into fuller, stronger hair. It's specially formulated not to weigh hair down. 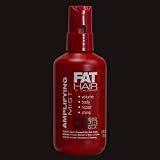 It also includes Fat Hair's exclusive Amplifying blend of protein, extract, inositol and taurine to help volumize and repair limp, damaged hair for a fuller, shinier, healthier looking style. After I'm done washing my hair, I use the mist by spraying through damp hair, then styling as desired. I can use this amplifying mist with no other hair product and it gives the desired messy, tousled look (not the "didn't do a darn thing with her hair" look). Fat Hair products are available at Walmart, Rite Aid, CVS, Walgreens and FatHairStore.com. I've seen them on the shelves at some of these places and never really considered purchasing them. I have no doubt in my mind I'll be purchasing Fat Hair in the future, now that I've tried the products. It's been the best at giving me the volume I want, without damaging my hair or weighing it down. One person will win Fat Hair products that includes Advanced Repair Formula Amplifying Shampoo, Conditioner, Root Lifter, Crème, and Mousse. Every year during the holidays I always make these salty/sweet confections. My older sister passed the recipe on to me some time ago and I've found that they're easy and fun to make. Directions: Spread peanut butter on a cracker, then put another cracker on top to make a patty. Dip the sandwiched pretzel patty in melted almond bark until it's covered completely. Top with pecans or decorative sprinkles. Let cool before serving. Robeez, the original soft-soled shoe for babies and toddlers, should be on your radar for holiday gifts. Robeez are the perfect stocking stuffer for moms-to-be and their littlest carolers. Comfortable and long-lasting, Robeez soft- soled cushions allow for tiny toes to have a better grip on surfaces, promote balance, and encourage muscle growth. Offering modern twists on a classic design, Robeez has offered its signature, pediatric-endorsed products for babies and toddlers up to 24 months old since 1994. In addition, Robeez has also recently launched a new collection in partnership with Disney Baby, the Disney Baby Collection by Robeez, which with a variety of imaginative designs featuring everybody’s favorite Disney characters including Mickey and Minnie Mouse and Winnie the Pooh. I've done a couple of reviews for Robeez in the past, with my niece as the one wearing them. 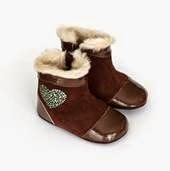 Their footwear is adorable, stays securely on feet, and have non-slip grip. 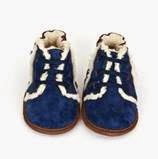 One person will win a pair of Robeez Footwear, size 6-12 months, in choice of boys or girls. (Sponsor will randomly choose exact style). Last Friday my husband gifted me with a hotel stay at Eagles Nest. My son, Adam, stayed with us. It was no ordinary night; it was Night at the North Pole. For a fair price, guests were able to stay for a night and visit with Christmas characters, do crafts, eat breakfast with Mrs. Claus, watch holiday movies, and much more. Eagle's Nest has a homey feel and is beautifully decorated. The floor we stayed on had a car theme. There was vehicle parts, signs, and décor everywhere. We were able to spend quality time with some family who also stayed. 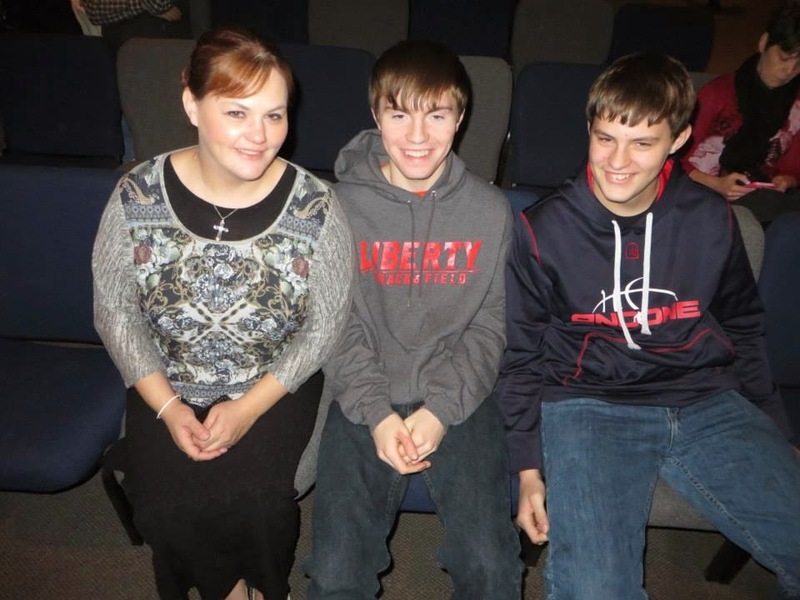 My sister, her husband, and son were there. So was my nephew, his wife, and their three girls. The craft and activity room had tables set up with different stations for coloring, making ornaments, crafting, and a marshmallow fight. Olaf made a special appearance and we took the opportunity for photo opps. Although I didn't wear them, pajamas were encouraged as the clothing choice. Guests were able to have a supper of pizza, juice, soda and cookies at no additional charge. Santa told children stories and each child was able to give their wish list. Santa also told children the story of Jesus birth. The adults had as much fun as the kids. Most of the place was adorned with Christmas décor. Ozzy and Adam took time to swim in the pool. I've stayed at Eagle's Nest a number of times now and can't rave about it enough. The staff is extraordinarily friendly and we've come to know them on a first-name basis. The place is very involved with the community and helps whenever it can. In fact, the same night there was a very large fire at a hotel turned residential area. Over fifty people who called the place home were displaced. Eagle's Nest's manager, Jack, immediately went into action and offered a free weekend stay with pizza - no strings attached. I may not be a young'un but I felt transported back to magical childhood days of holiday fun. I'll definitely be spending the night at the North Pole again next year. My house generally stays busy with people going in and out. If it's not my kids, it's company coming over to visit or a family gathering. Because of this, I always keep snacks on hand. We were recently able to try snacks from Snikiddy, a line of snacks made from simple, wholesome, real-food ingredients. They didn't last long in my household. It seems everyone enjoyed Snikiddy snacks. Of the six packages we tried, the Cheese Puffs were our favorite. There are two varieties available - Baked Mac n' Cheese and Grilled Cheese. The baked corn puffs have an airy, crunchy texture with tasty flavors. The Mac 'n Cheese Puffs are white in color and noodle shaped. The Grilled Cheese puffs are round and orange in color. 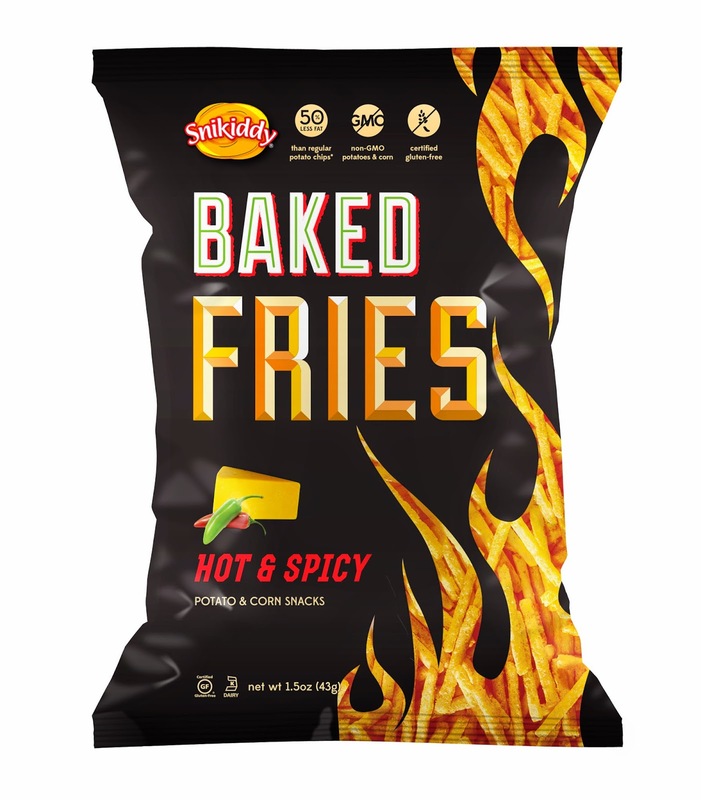 Snikiddy also has a Baked Fries line with six flavors. We tried Hot & Spicy and Barbecue. They also have a crunchy texture. They are 50% less fat than regular potato chips, but don't compromise on taste. The Hot & Spicy Baked Fries have quite the kick so I wasn't a big fan but my husband was quick to eat them all. 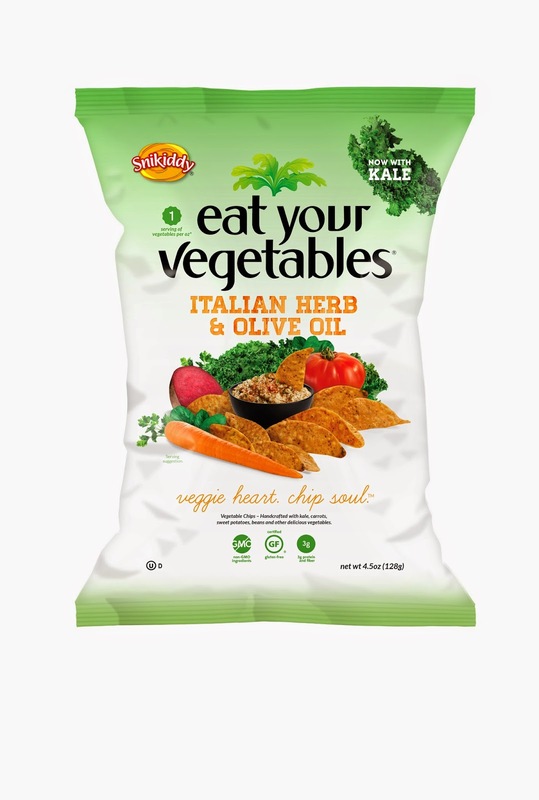 The Eat Your Vegetables snacks combine the taste of chips with veggie goodness, providing eight great vegetables in every ounce with a unique blend of sweet potatoes, carrots, and navy beans. Although they don't replace the need to consume regular vegetables, they are a good way to incorporate them into your diet. And, from experience, the kids don't whine about eating these like they might actual vegetables. For being considered a snack line, Snikiddy produces flavorsome munchies that won't wreck your diet or waistline. The winner of the Datevitation giveaway is #4, Sacha Schroeder. The winner of the Sourcebooks giveaway is #6, Courtney B. The winner of the Shopping Season Survival Kit giveaway is #7, Natalie F.
The winner of the I See Me! giveaway is #2, Kimberly. The winner of the Navy SEAL Noel book giveaway is #6, Heather B. The winner of the Mary Kay giveaway is #28, Diane. This here is Helen Dog Heck and I'm guest posting for mommy today. I'm her pet Labrabull. I drive her absolutely bonkers sometimes but I'm sure she still loves me. Right mom?!?! The holidays are here and I wanted to tell Santa what I'd like for Christmas. On my list is big ole' bones, crunchy snacks, and squeaky toys. I sure hope Santa thinks I've been good. I hope he doesn't count the times I've dookied behind the recliner or the times I've shredded my toys to pieces. On mommy's birthday she took me to Petco to get my picture taken with Santa. Almost made me think it was my birthday! As much as I like the pet store, I sure had to wait quite a while. It must have been an off day; there was no ink to print off the pictures and Santa had no shoes. An employee took off to buy both. Traffic must've been busy because it took an awfully long time. While we waited around to get my picture taken, mommy found the cutest doggie dress and just had to buy it. I've never worn clothes before. I didn't know I looked so darn adorable in a doggie dress. Now I have to add that to my Santa list! After forty-five minutes, the time finally arrived. I was able to get next to Santa. He wasn't as jolly as I thought he'd be. Mommy took a bunch of pictures of me. She must really like me. It was my first day for doggie clothes and my first visit with Santa! I generally take a meal to work every night. Two of my kids also pack their lunches for school. Although I'll sometimes use paper products, I tend to gravitate towards using reusable bags, cups, and dishes. rove is a company whose bottom line is to help protect the environment by offering eco-friendly mugs, tumblers, and more. I've been using some of rove's products lately when I am on the go. Each rove product is made with either BPA-free plastic, or other best-in-class materials like stainless steel, Eastman Tritan™, vitrified porcelain, and borosilicate glass. Additionally, rove features patented technology and innovative features such as Freezer Gel Technology™, Gel Air Surround™, Ice Pods™, Vacuum Insulation, Triple Wall Insulation, and Double Wall Insulation. I'm quite impressed with the three rove pieces I received. The company has taken reusable dishware and added extras to them for nice usage. 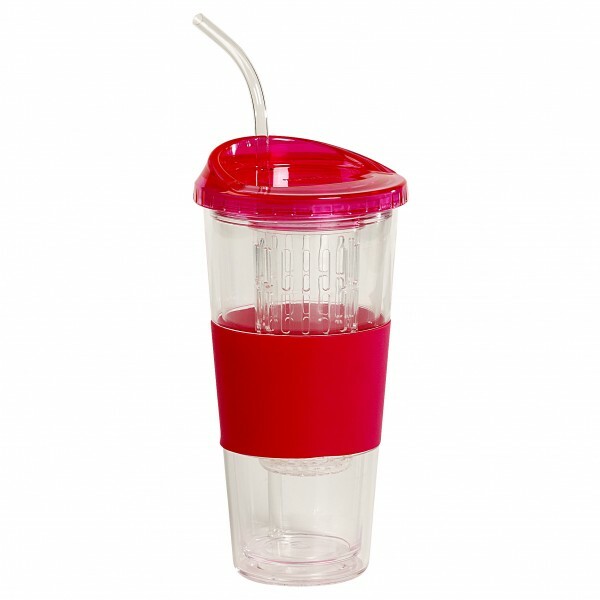 The 20 oz Double Wall Flavor Infuser Tumbler is much more than a drinking cup. The cylinder inside the tumbler can be filled with ice, fruits, or other beverages to infuse flavors. I've filled the cylinder with crushed ice and it keeps my water cold. I've also taken the opportunity a couple of times to add an energy drink to the cylinder while pouring Jager inside the actual tumbler, making an adult mixed drink. It comes with a curved straw and you can drink your beverage from it, or there's a mouthpiece on the lid that you can drink from. A protective sleeve helps keep grip on the tumbler. The 7-Piece Laptop Iced Bento Lunch Box allows you to carry lunch in the way that you want. It includes a plastic spoon and fork, and a freeze gel pack. It has a handle and a hinged lid that locks in place. Triangular compartments allow you to put in portions of your food. Or, if you prefer, you can take the triangular compartment section out and just have one single square area for food. When you want to keep the food cold, all you have to do is put the gel pack in the freezer, allow it to get cold, then attach it to the inside of the hinged lid. 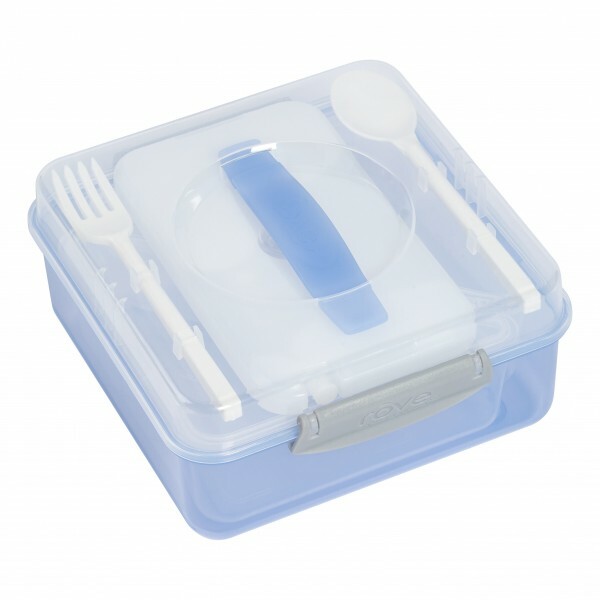 The lunch box parts are microwaveable, so you can just heat it up without adding extra dishes. It holds a good amount of food, and it's a smart system for packing lunches. 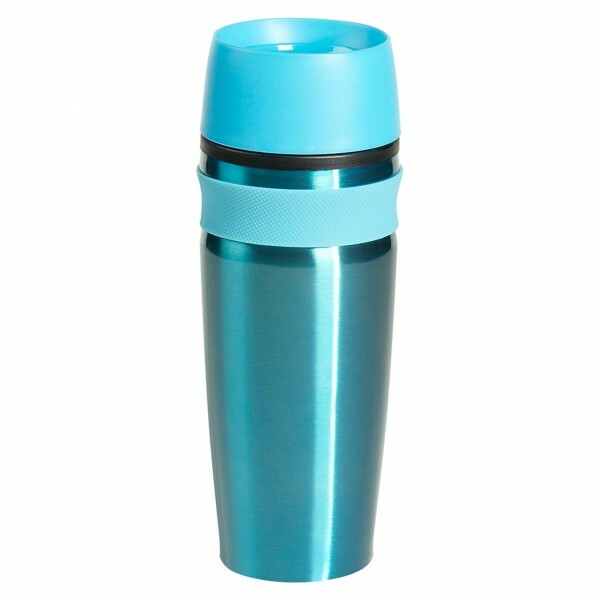 The 14 ounce double wall hot & cold hydration mug is perfect for keeping beverages hot or cold. It has a feature that I've never seen or used before; a one-touch push open lid. Rather than drinking out of a mouthpiece, the beverage is dispensed when you push a button on the middle of the lid. The liquid then comes out around the rim and you drink it from there. By pushing the button again, it provides a leak-proof seal. I've found that you have to ensure all the liquid has been drank from the rim before pushing the button again or else you might get some of it on your fingers. Other than that, it's a nice, stylish mug.